With an hour of school left on this Tuesday afternoon the classroom was a hive of activity with the desks placed along one wall and all the children helping paint a background scene on a massive roll of cardboard that would be hung along the back of the hall stage for the breakup. A screech of car brakes made Karla glance up. She noticed the fleeting image of a white car swinging around with the tyres smoking. There was a whoosh followed by a bang. After a second of silence one of the children screamed. Everyone stood up and more children began to cry out, sob or run to her. Something had exploded in the porch! Luckily, the interior door to the porch was closed but like the rest of the century-old building it was wooden and bone dry, Smoke, dirty black stuff that stunk of cordite hissed through the gap under the door. It was less than a minute but already Karla could feel the room heat up and hear a cracking sound. Children began to cough. It was up to her! Justine’s face was white but he acted first. Each of the two senior pupils had five younger ones to look after. He rushed forward, literally lifted two little ones up in his arms, gathered up the other three and like a shepherd with a flock of sheep, headed for the rear door. The girl who had stood there frozen for a second now burst into action. She grabbed the hands of two eight year olds and desperately looked around for three more. Smoke poured through the door and rose to the ceiling. The interior door burst into flames from the bottom up and the whole side wall sort of bulged out. In seconds it would collapse in on them. But one child was missing! Karla stared in horror as Tina the five-year-old ran towards but not away from the now flaming wall. “Tina!” Karla shouted, handed the children holding her hands onto Lorena who glanced at Karla, wiped her blinking tear-stained eyes and headed to where Justin was waiting by the door with one hand out. “Bobby!” howled little Tina. As Karla grabbed her in a tight hug, the little girl screamed, hit out and kicked. Bobby was her teddy bear that she always brought to school with her. “I’ll take Tina!” Lorena was beside her. Karla nodded, handed the little girl over and saw the teddy bear a few metres away. She rushed forward just as the entire left hand wall exploded in a sheet of flames. Acid smoke and searing heat engulfed her. She staggered, eyes streamed with tears and she could smell burning hair. Her hair! What was she there for? Yes, Tina’s teddy. She saw it though the smoke, coughed, gasped for breath but managed to grab the soft toy before she turned around. She saw Lorena and Tina heading out the opened back door. Flames were everywhere, the cardboard on the floor was alight and pottles of paint bubbled and hissed like miniature fireworks before bursting into flames. Oh my God! Her clothes had started to burn! She staggered forward, felt rather than saw the door ahead and lost her footing. She fell forward, hit a side panel and would have crashed to her knees if a hand didn’t reach out and seize her. She was hauled forward and realised it was Justin who had grabbed her. “The other children?” she gasped between coughing spasms. They raced forward! Behind, the door they had just come out of burst into a sheet of flames. Two seconds earlier and… Karla felt dizzy but swallowed and stared out of her stinging eyes. Before her, sitting cross-legged in front of the woodshed were the eight younger children. Lorena stood beside them with a sobbing Tina still in her arms. “If you want me to,” he muttered in reply. The boy looked at her intensely, shrugged and ambled across to the tank. She saw him do what she had asked and switched her attention back to the other children. The teddy bear was still in her hand so she went across to Tina. “Bobby’s safe too,” she whispered and handed it to her. Only then did she turn to face the building. It was a sheet of flames that poured up the walls while smoke poured out horizontally from under the roof. The whole structure shivered, there was another gigantic retort and several pieces of roofing iron exploded straight up in the air through black smoke before crashing down only twenty metres from them. The heat was intense and most of the children were crying but thankfully, none panicked and they still sat cross-legged on the ground. This time around, Lorena responded first. “Come on Red Group.” she said, gathered up her five including Tina with the teddy bear and moved around the shed. “And I thought you were being a bit fussy with that fire drill last week,” Justin continued. “If Old Ted was here…” He shrugged and waited for her as she walked around the shed. 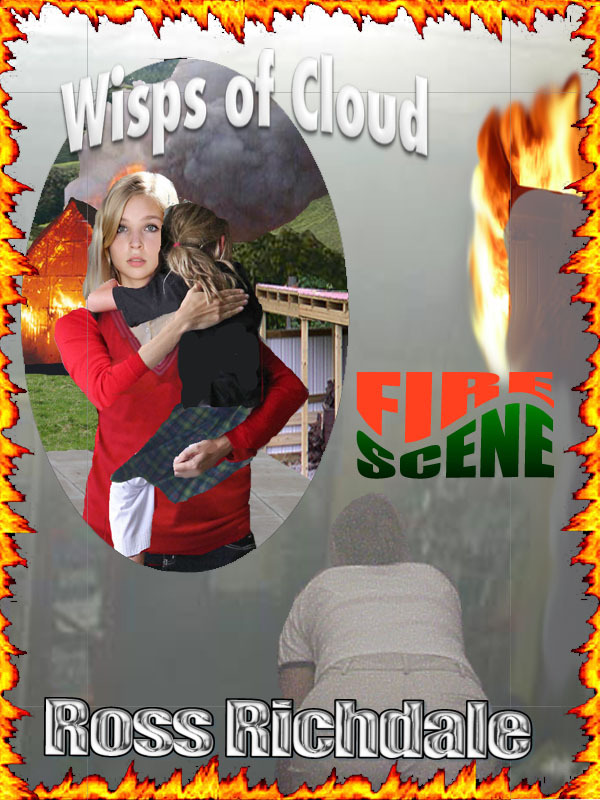 Behind them, there was no school, just a rectangle of towering flames with now brown smoke bellowing into the air.